I didn't have time to post last week's Sunday reading. Now there's quite a backlog. Here's three articles to get you started. I'll post more in the next few days. 1. Hybrid Cars. I was driving down Broadway the other day and found myself counting hybrids. From the Holiday Neighborhood to Table Mesa, I must have passed two dozen or more. I'm not kidding. Priuses, Civics, Escapes, Insights, and Accords. One after another, a parade of clean and green machines. You could say that next to Subaru Outbacks, hybrids have become ubiquitous in the People's Republic. If you live here, you must have noticed. To honor the Boulder hybrid frenzy, there's an article by OmniNerd. He does that math and asks, "Is a Hybrid Worth It?" And by doing the math, I mean it. The post will satisfy your inner statistician with a flood of tables, charts, and formulas. There's even 49 references in the footnotes. Oh, and just in case you think I'm anti-hybrid there's a rebuttal from a new owner of 2007 Prius. 2. Union Station. 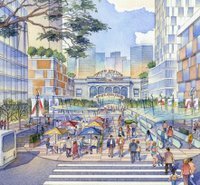 You probably know by now that Continuum Partners was chosen on Nov. 15 for the $1 Bn redevelopment of Union Station and surrounding 19.5 acres in Denver (cute artist rendering on the right). If you're interested in this project (and you should be), this is another (albeit much larger) Transit Oriented Development (TOD) like Boulder Transit Village. It also has sustainability at it's heart. 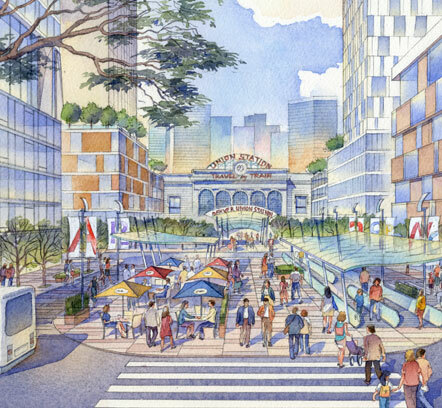 In addition to efficient access to multi-modal transportation, the plan calls for 783,000+ SQFT of residential, 732,000+ SQFT of office, and 246,000+ SQFT of retail with parking for nearly 2,000 cars. What you may not know is that Union Station is only one of many developments that Continuum Partners are driving in our region, summing up to over $3.5 bn in projects underway according to the Rocky Mountain News. Congratulations to Mark Falcone, CEO and Founder of Continuum. 3. The 1800 Larimer St. Tower. While we're on the subject of LoDo and green building, it looks like a new project is planned for 1800 Larimer. Westfield Development Company has proposed a $150 million, 22-story, 500,000-square-foot office tower. Not only will this be the first new high-rise office building downtown since the mid-1980s, will also be the most energy-efficient high-rise in downtown Denver according to Rich McClintock, Westfield's President (source: Rocky Mountain News). The building is not only energy efficient but it's designed to provide a welcoming environment with plenty of natural light for workers (shown to boost productivity). Wow. That was so much math and so many graphics that I only had the attention span to skim it. I agree with the conclusion though. You could probably do better with a mid-size or small car, but I think hybrids are the wave of the future and soon enough we'll see them comprable in price to other cars, or, at least when we get some newer, cooler technology. As for the snow today, I'm kinda glad I have a Suburu. I agree with the conclusion too. As much as I like Hybrids, the math supports a small/midsize economical car. My next one will probably be a Subaru too. At least until Honda unrolls their hyper efficient, clean diesels in 2009 or so. p.s. Did you know Honda is taking office space in Longmont?